National Gallery services are at threat due to redundancies and reorganisation. Staff fear jobs are being changed in a way that appears to prioritise raising money over delivering a public service. Services threatened include the support to schools such as visits by guided groups of 70000 school students a year. Instead of building on the extensive knowledge and experience of the collection, staff face multiskilling and downgrading. It is proposed to extend contracted hours for staff from 08am to 10pm with no additional payments. Gallery plans have also recently emerged to pay for the Living Wage by cutting other payments to low paid staff such as weekend enhancements. While the Director received a 20% bonus on his £140,000 salary, workers who ensure the safety of some of the world’s most valuable paintings start on £15,468. The National Gallery is one of only a small number of major institutions that do not yet pay the London Living Wage. PCS has submitted a claim insisting the Living Wage is implementedin 2014. We are demanding that additional funding is found to eradicate poverty pay. New government regulations allowing the gallery to use their reserves could enable this to happen. 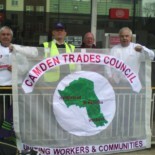 This entry was posted on March 8, 2014 by CAMDEN TRADES COUNCIL.